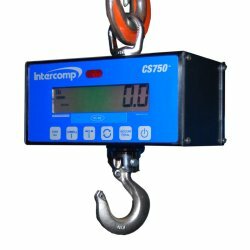 Intercomp CS-750 is a high accuracy compact digital hanging scale for low capacity industrial applications. Capacities for the CS750 run from 25 pounds up to 1000 pounds. The scale features a high visibility 1 inch Liquid Crystal Display (LCD) with backlight and will operate for up to one year on (6) D batteries. Crosby eyehook and bottom swivel hook are standard. Full featured infrared remote control is included with item. alkaline dry cell Battery life is one year of normal use. Normal leadtime before this product ships out is 1 week.